Marine Surveys of Bays and Marinas for Influx of Non-Indigenous Invertebrate Species and competititon with native species. Settlement by Styela clava in late Spring 2011 on a mooring rope in Cape Cod Bay at MacMillan Wharf, Provincetown, MA. 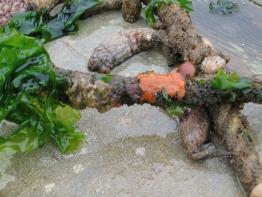 In the right photo, sea lettuce (black pointer), a colony of Botryllus schlosseri (star), and an orange colony of Botrylloides violaceus (orange pointer) are shown. Bugula neritina (left) and Membranipora membrancea (right) showing zooids lophophores. Used with permission. Lovell & Libby Langstroth © California Academy of Sciences. Bugula: The zooids entrap organic particles with their extended lophophores; they brood ova in their translucent, globular ovicells. 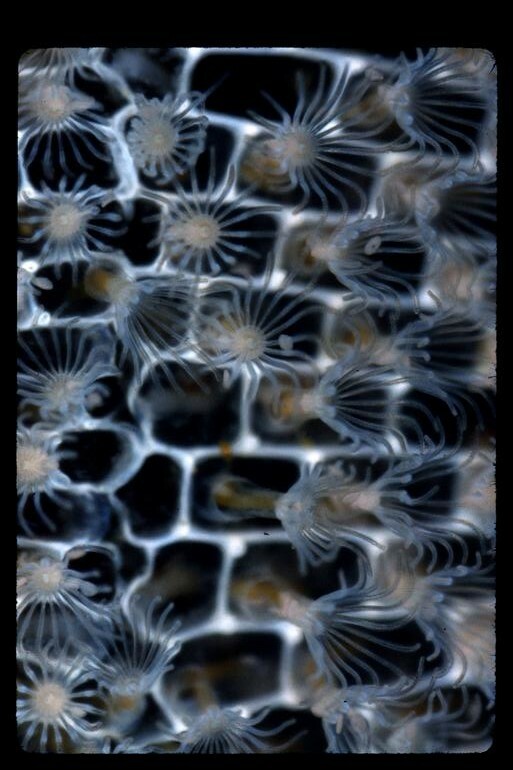 Membranipora: A colony on a surface blade of kelp. 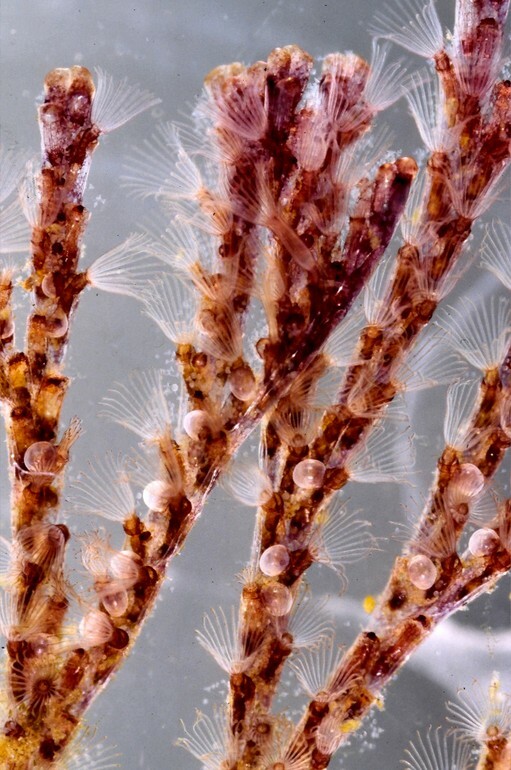 Each individual is extending its feeding tentacles, the lophophore. They spawn fertilized eggs and each individual compartment is 1mm long. 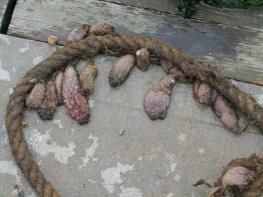 Bugula neritina (left) and Membranipora membrancea (right) are common non-indigenous species in Massachusetts Marinas. 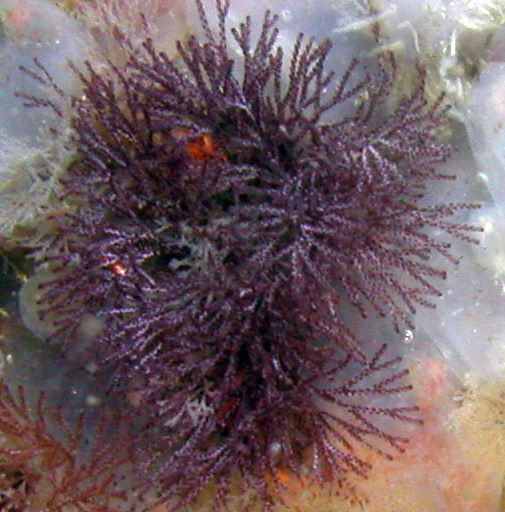 Bugula neritina is typically found among mussels, algae and solitary ascidians coexisting with native Bryozoan species such as Bugula simplex. 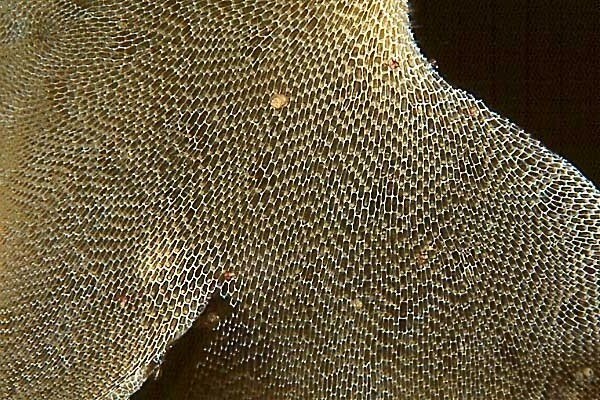 Membranipora membrancea is an encrusting bryozoan on Laminaria kelp blades along with the native species, Electra pilosa.